Don't miss out on the fun and festivities of Homecoming 2017. Check out the full calendar of events, which kicked-off this weekend with the Homecoming Dance and Paint the Town Red (see photo) and will last all week long! Homecoming 2017 is designed to bring our entire community together – from Woodbury all the way to Marine – and celebrate what it means to be a Stillwater Pony. The first-ever Pony Homecoming Carnival is just a few days away! 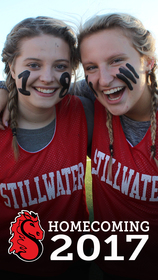 Join us Friday, Sept. 15 from 4-6:30 p.m. at Stillwater Area High School for games, music and food! This free, family-friendly event will feature traditional games and activities for all ages, including inflatables, a dunk tank, face painting, photobooth and more! Enjoy stage performances by our high school musicians. There will also be plenty to eat with concessions and food trucks.. When you are at the homecoming carnival and football game check out our custom filters on Snapchat and Facebook! Don’t forget to pick up an official 2017 Homecoming t-shirt at Heritage Embroidery. See the carnival schedule and more online. Come see the amazing new learning spaces our community helped create. Ribbon cutting ceremonies and open houses for Brookview Elementary and Stillwater Area High School/Pony Activity Center (PAC) will be held this week. Brookview Elementary, located at 11099 Brookview Road in Woodbury, will hold its open house on Tuesday, Sept. 12 from 6 to 8 p.m. The ribbon cutting will take place at 6 p.m., with tours to follow. SAHS/PAC will hold its open house on Friday, Sept. 15 during the Pony Homecoming Carnival. The ribbon cutting begins at 4 p.m. in Pony Plaza, located on the west end of the building. Tours will be held from 4:15-5:30 p.m. Visitors will be able to tour the new learning spaces at the high school and learn more about community membership at the PAC. The school board will hold a business meeting at 5:30 p.m. on Thursday, September 28, 2017 to Certify the Levy Payable. The meeting will take place at Central Services, 1875 South Greeley Street, Stillwater, MN. Read the official notice.